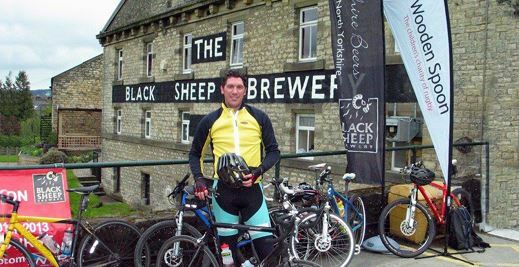 The Black Sheep Brewery managed to raise around £20,000 for charity after 130 cyclists took part in the 3rd annual Black Sheep Firkin Challenge. There were 2 different courses for different competency levels – “The Barrel Breaker” a 60 mile course and the “Mash Ton” a 100 mile course for riders really wanting to push themselves. The latter route passed The Tan Hill Inn, the highest pub in England. The day ended with cyclists dropping in at the Brewery, based in Masham, for a thirst quenching pint of Black Sheep. All the money raised from the Challenge is being donated to Wooden Spoon, the rugby orientated children’s charity. The charity aims to improve the quality of life for children and young people who are disadvantaged physically, mentally or socially in the UK and Ireland, giving them a chance to achieve their full potential in life. Both Black Sheep managing director, Rob Theakston, and his brother Jo, director of marketing and sales, completed the challenge, along with other members of staff from the brewery and visitor centre – a mix of experienced and novice cyclists. “We are delighted at the continued success of the Firkin Challenge as it enters its third year. The support we have received from those who have sponsored us has been terrific, and to raise so much money is absolutely fantastic. The event is always tough, but it’s great to see everyone enjoying a well-deserved pint of Black Sheep at the end of the course.